Banner Engineering introduces the EZ-LIGHT® K30 Touch, a smaller version of the company’s industry-recognized K50 Touch. Featuring a compact, rugged design, this single-point device is designed for efficient machine activation and pick-to-light operations. K30 Touch requires no physical pressure to operate, preventing stress on hands and wrists from constantly pressing buttons to actuate machines or verify correct picks. Designed for flexible use, the K30 Touch is available in 1- or 2-color models and offers either latching or momentary outputs. 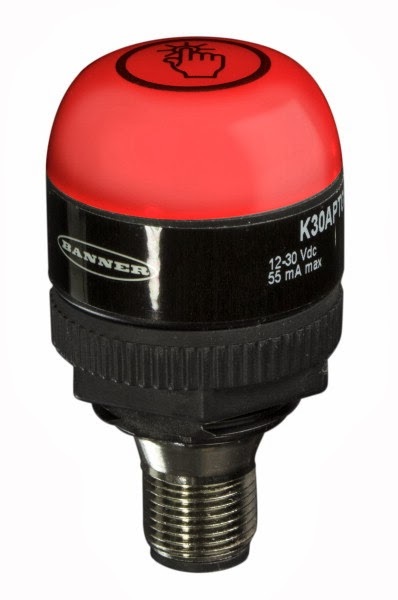 The sealed, durable K30 Touch features a housing rated to IP69K, allowing it to easily withstand harsh conditions and moisture in challenging environments. Its 22-mm threaded base fits most control panels, making it a drop-in replacement for standard pilot lights and push buttons. Banner has provided us with a Holiday video we think you will enjoy....MAY THE FORCE BE WITH YOU!